POINTE SHOES SLIPPING OFF HEEL – HOW TO SOLVE VIDEO! A very common problem is pointe shoes slipping off the heel of dancers. Luckily enough it is actually a very easy problem to solve! I have made a video below showing you what to do to keep your pointe shoes slipping off the heel of your foot and how to make them more secure. Showing pointe shoe heels and where the placement for the elastic should be on a pointe shoe to be best effective. Quite simply, all you need to be doing is actually sewing pointe shoe elastics onto your shoes. I recommend Bloch Covert Elastic or Tendu Invisible Elastic. The key is to use a good quality thick thread. Ideally waxed thread or even dental floss! I use the Bunheads Stitch Kit which comes with fantastic heavy duty waxed thread. Ensure you do a row of stitches. I like to criss cross my stitches and do at least 2 rows. I also double my thread whilst sewing. How I sew my pointe shoe elastics detail shot. 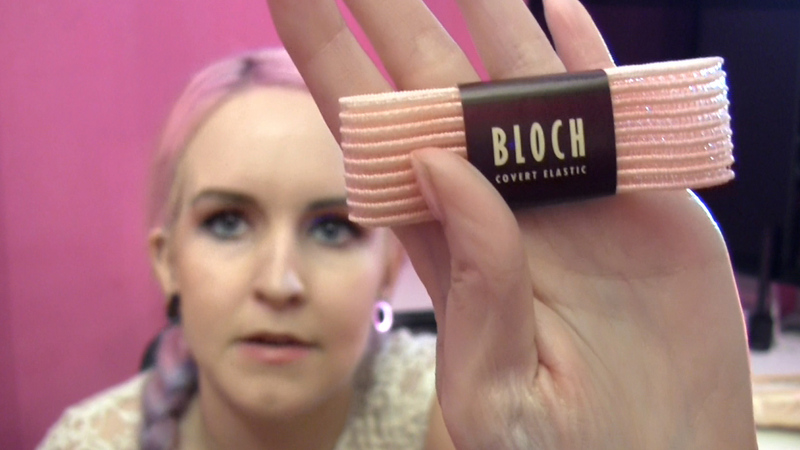 Bloch Covert Elastic – one of my preferred brands of elastic for pointe shoes.